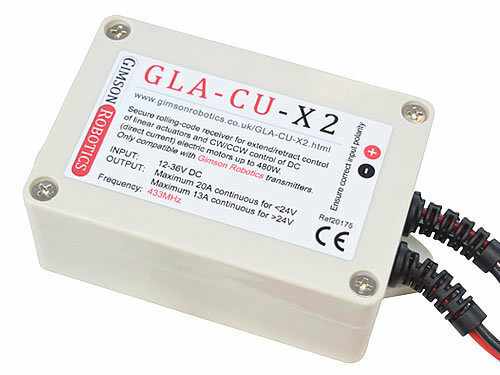 The GLA-CU-X2 is a reliable remote control system allowing any DC (direct current) linear actuator or electric motor rated to operate at 12V, 24V, 36V or anywhere in-between and with up to 480W in power to be operated by remote control. Included with each receiver is a ready-paired chrome key fob transmitter. Additional key fobs and also longer-range wall-mounting remotes are available to purchase separately. The controller is the culmination of several years of development and offers many useful features in a small package. Features include selectable momentary or latching control modes, wired-switch control inputs, an energy-saving output timer, and rolling-code transmission. 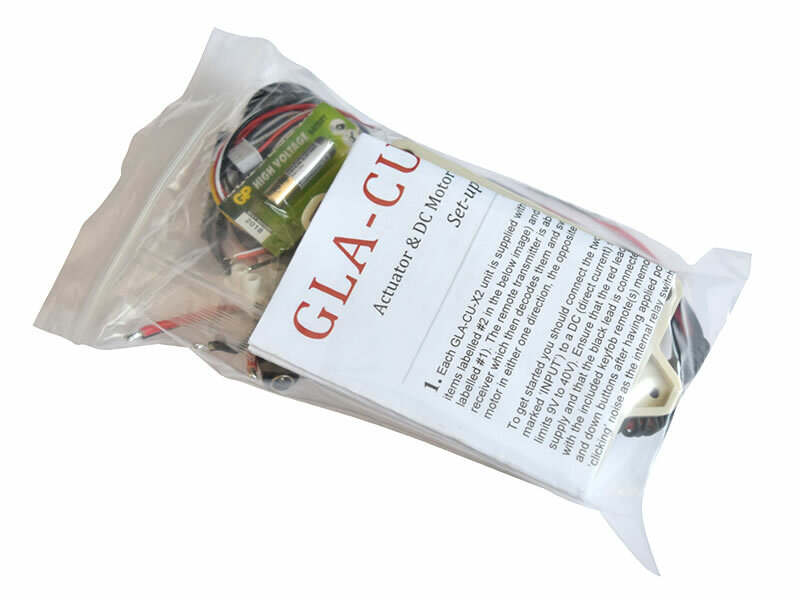 In most cases you can simply attach a power source (such as a mains AC to DC adapter or a battery) to the two leads with the tag labelled 'INPUT' and the actuator or DC motor you wish to control to the two leads labelled 'OUTPUT' and you're good to go. Uses for the control unit include remote operation of adjustable beds and furniture, home automation devices such as electric windows and doors, and other custom builds involving linear actuators or electric motors. 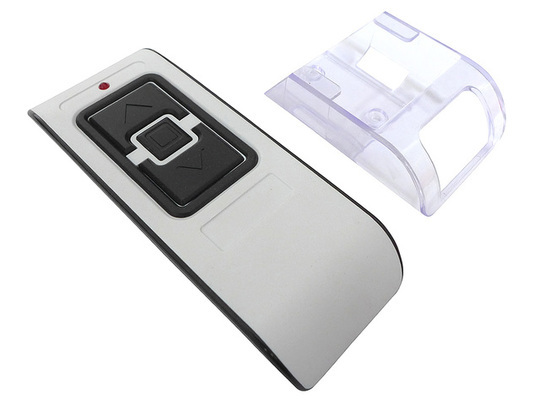 Each receiver unit is supplied with a single key fob remote control (as shown in the main product image), suitable for wireless control at up to 25M away. Spares/additional key-fob remotes are available separately, along with a larger hand-held remote model capable of operation at up to 200M (distances given are for line-of-sight transmission and the effective range is reduced when obstacles are present between the remote and the receiver unit). One or multiple remotes (up to 7 at once) may be programmed to each receiver, such that multiple receivers may be used independently in the same transmission area. Only Gimson Robotics-supplied 433MHz rolling-code remotes are compatible with these receivers. Each remote has three buttons, two buttons denoted by arrows for forwards and backwards travel (or for clockwise and counter-clockwise rotation of a DC motor), and one button for stopping marked with a square. Two control modes are available, either 'Latching' whereby you can press a forward or backward button momentarily and the actuator or motor will keep travelling in the selected direction until either the opposite direction of travel is pressed or the stop button is pressed, or 'Momentary' whereby an output will only remain on for as long as a button is pressed, and will stop when the transmitter button is released. Each receiver is supplied with latching as the default mode, to enable momentary control you simply need to remove the lid of the unit and remove a small black jumper from the position labelled S1 on the circuit board. For more detailed information on using the device please see the technical details section below. Current version (Chrome remote) set-up guide (PDF, 1MB). Older pre-June 2017 set-up guide (PDF, 1.1MB). 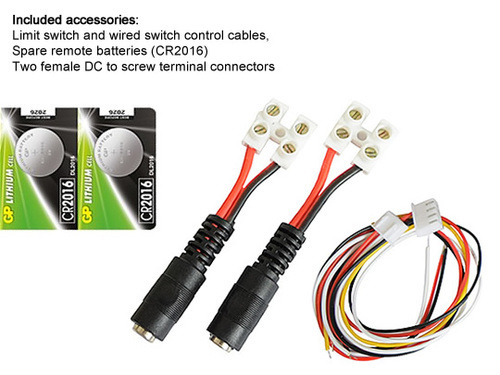 The unit requires connecting to a DC supply (with positive and negative, not alternating) of between 12V and 36V. 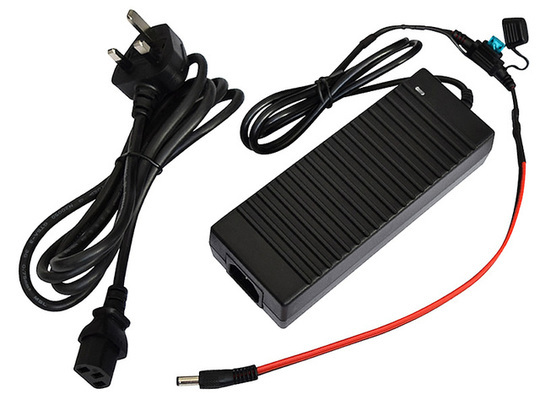 For example a 12V, 24V or 36V battery, or the output from a mains AC to DC adapter. The input supply runs through the control unit and then out to the device to be controlled and so should be rated to supply sufficient current for the device connected. The control board itself consumes only 0.288W of power (24mA at 12V) when inactivated and awaiting a command. When a relay is switched (and the output is on) the load will increase to approximately 1.48W (124mA at 12V). 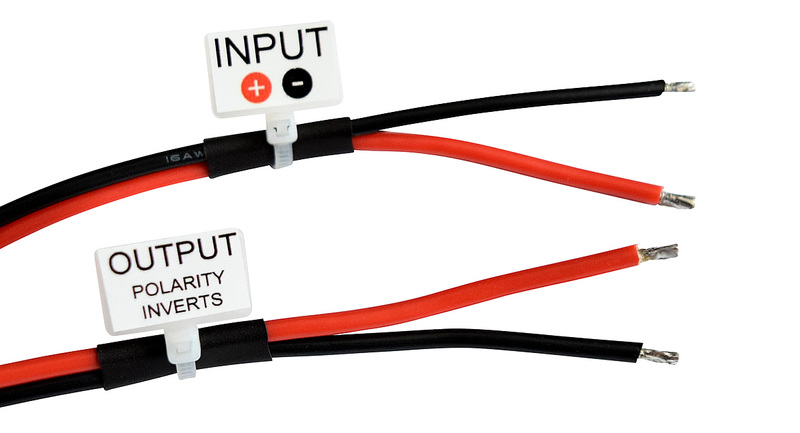 It is important that the input DC current is applied the correct way around, with positive connected to the red lead and negative to the black lead. 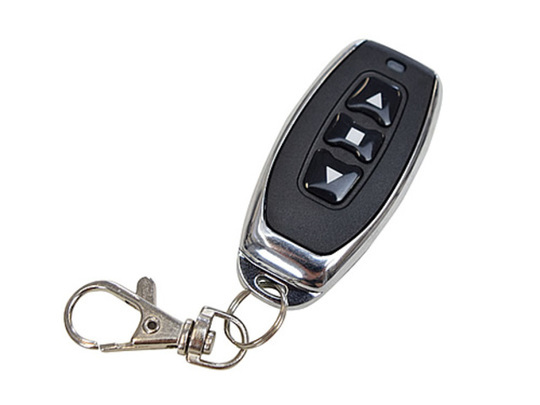 The included key-chain (key fob) remote takes two CR2016 3V coin-cell batteries, two of which are supplied inside each remote ready for use, with two spare batteries also included in each receiver set. Spare key-fob remotes are available to buy separately, along with larger extended-range remotes. The controller takes the input current and outputs either one polarity combination, off, or the opposite polarity combination, enabling a DC motor or actuator to operate in both directions. 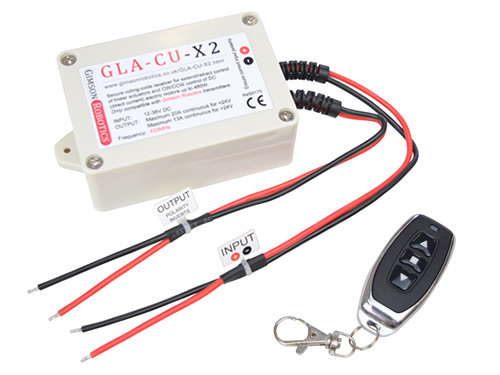 The output voltage will match the input voltage, so if 24V were supplied on the input then 24V will reach the output (when the output is activated). It is possible to operate multiple devices (such as a pair of actuators) from a single receiver, provided that the sum of power demands of the devices is below the maximum rated 480W, just connect the devices in parallel with the two output leads. 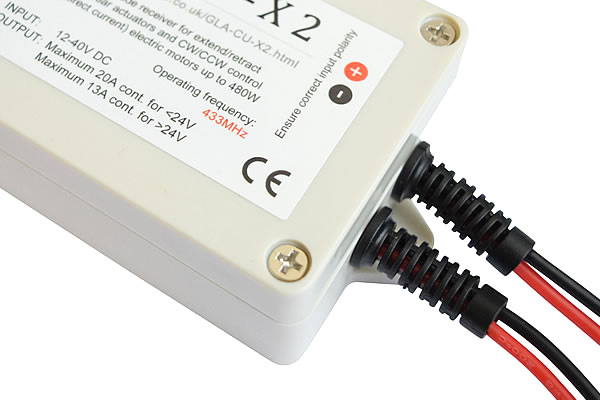 The maximum allowable current through the circuit is 20A continuous for input voltages up to 24V and 13A for voltages above 24V DC. You are advised to fit a fuse or circuit breaker to the output of the unit if there is a danger of your device attempting to consume a current greater than the maximum for your given operating voltage. The included transmitter and receiver operate at 433MHz, a standard frequency for devices of this size and which is approved for use in the European Union as well as many other countries worldwide. The transmitter and receiver use a 'rolling code' data encryption method (HCS301), making it harder for an unauthorised third-party to eavesdrop on a remote signal and later use it to operate your receiver (which is a common vulnerability of more common fixed-code transmission systems). Connect the unit INPUT lead to a DC power source between 12-36V, do not have the OUTPUT connected to a device at this point (and do not allow the ends of the OUTPUT leads to touch one-another). Be sure not to expose the board to any metal objects (such as loose screws) while the cover is removed. Check that when you (briefly) press one of the white push-buttons the LED on the board lights up, if it does then the receiver should be on. Have the remote you wish to program to-hand and then press the ‘UP’ button on the receiver board momentarily, release, then quickly press the up arrow on the remote. After pressing the remote button the LED on the board should flash and then turn off. Repeat step three with the white button labelled STOP and the stop button on the remote to calibrate this button. Repeat step three with on-board button DOWN and the down-arrow remote button. The board should now have learned the remote and the next time you press an up or down button (with the board powered) a relay should 'click' meaning the controller is switching the output current (provided that X1 and X2 are bridged). If you wish to reverse the operation of the remote (so that the up and down buttons lead to travel in the opposite directions to the default) then follow the 'learning' steps above but in the sequence K1 to up, K2 to stop and then K3 to down. To erase the memory of previously learnt remotes press and hold any white button on the board for a long time (around 10 seconds), the red LED should turn on and then after a long pause turn off which signifies that the memory is now clear, you can then release the button. 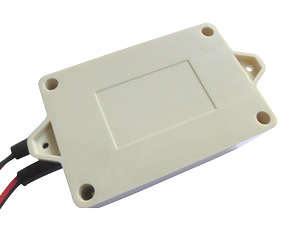 Although normally covered by the plastic housing, the unit has a row of screw-terminal connectors on the board which may be used as an alternative method of input and output power connection. Be sure to observe the correct polarity of the input supply if using these terminals. A pair of limit switch inputs are available towards one corner of the board (marked X1 and X2). 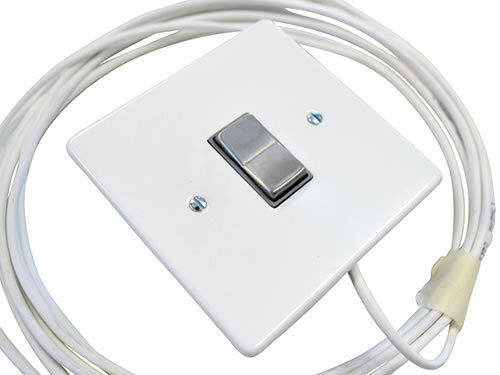 These are supplied with two jumpers which bridge each connector pair, if you wish to add limit switches to your device you will need to replace these jumpers in the circuit with switches which are mounted at the desired end points of travel. These switches should be 'normally closed', only going open-circuit when a switch is triggered. 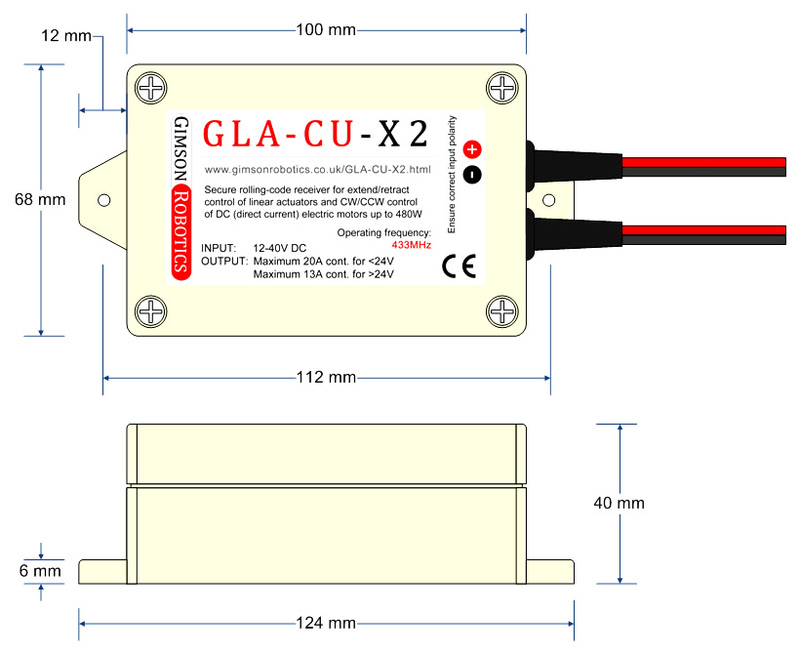 A lead with four-way header connector is included to enable access to the limit switch inputs. Further inputs are available if you want to add a physical (wired-in) switch to control the receiver (such as our wall switch), these are denoted on the board by 'UP, GND, DOWN'. If 'UP' and 'GND' are connected to one-another via a switch then the receiver will change the output to 'UP', if 'DOWN' and 'GND' are connected then the output will change to the opposite direction. Any inputs supplied to the board here will override instructions given by remote transmitters to the receiver. A lead with three-way (white plastic) connector is included for connecting to these inputs. The receiver has an optional timer function (enabled by default), which automatically switches off the output in latching mode if no new control instruction has been received within 120 seconds. This feature can help to save energy by minimising the time that a relay is being powered (whereas otherwise the relay would continue to operate until a ‘stop’ button were pressed). 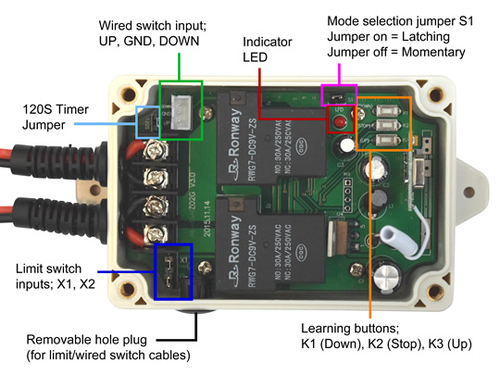 To disable the timer remove the black plastic jumper from the position marked ‘120S’ on the PCB (by the wired-switch input connector). The unit is suitable for outdoor (high humidity) use provided that it is shielded from direct water exposure. 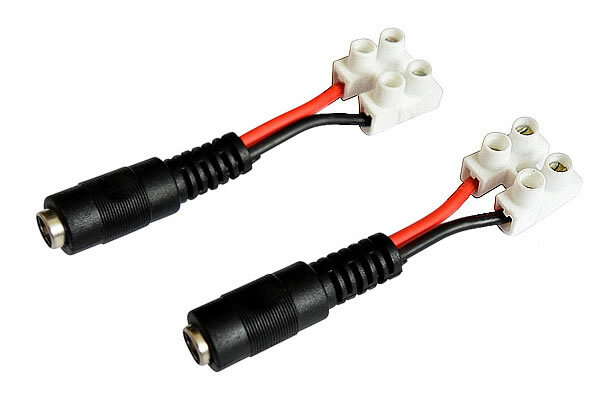 Two screw-terminal to female DC (2.1 x 5.5mm) connectors are included with each receiver, which may mount directly onto the ends of the leads to simplify connections to power supplies or actuators with male DC connectors already fitted.